This is a partner post in cooperation with VTech Phones. We have had the same home phone for who knows how long. It is a cheap phone we picked up at the dollar store one night when our previous one bit the dust. There were no bells, no whistles no nothing, other than a cordless phone that had static on our end more often than not. 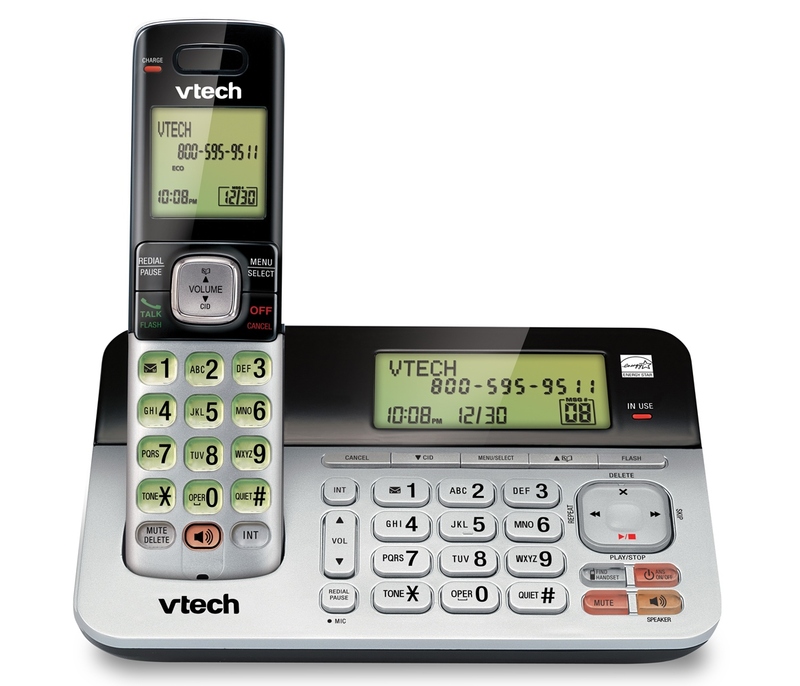 So, when I was approached to try out the new "hub of the home" VTech CS6859 Cordless Answering System, I was thrilled! Up to 14 minutes of digital answering time, for those times when you can't get to the phone. Full duplex handset and base speakerphones allow both ends to speak and be heard at the same time, so it is more like a real live conversation. Caller ID and Call Waiting that stores up to 50 calls while displaying the name, number, date and time of each call. ECO power mode that conserves energy and allows for optimal battery performance. Backlit cordless handset, keypad and display so you can always see every detail, even in poor light. Quiet mode, to allow you to silence the ringer for a certain period of time. I love this phone! You have no idea how many times I had tried to take a nap when I was pregnant with the surro-baby last year, only to be woken up by the phone ringing because we had no way to shut it off. The quiet mode on this phone is great, and I used it just yesterday for an hour so that I could catch a quick catnap before getting the boys from school. You just press a button, put in how many hours you want the quiet time to last and you will never be bothered! The look of the phone is a lot nicer than our old one and a lot easier to clean, with it's sleek finish. The backlit display on both the phone and answering dock makes it really easy to see at night and I no longer have to run into the light to tell who is calling. Listening to messages is a breeze now too. I used to have to dial a number and then listen to all of the messages in order, with no way to skip or delete them unless I listened all the way through. It took forever! With the VTech CS6859, I can simply delete or skip a message right away if I don't want to listen to it. Sound quality is perfect on this phone, and almost like talking to someone in person. The hands-free speaker phone on the keypad saves me from hunting down the handset when I need to answer a call too. With four boys, you never know where the handset will be and just being able to press the speaker phone option and have a conversation hand-free is a life saver. All in all, we really love the new VTech phone and I can't see us switching anytime soon, especially since you can expand the system with up to five handsets! The VTech CS6859 Cordless Answering System is really reasonably priced! It gives you a lot of bang for your buck and you can purchase it from Walmart for under $40! Want a chance to give your home phone a makeover? Enter to win a VTech CS6859 Cordless Answering System using the Rafflecopter form below! I was compensated for my time in creating this post and received a VTech phone to review and one to giveaway, all thoughts and opinions are my own. Originally published on 2013-06-14 by Mom at Life With 4 Boys .